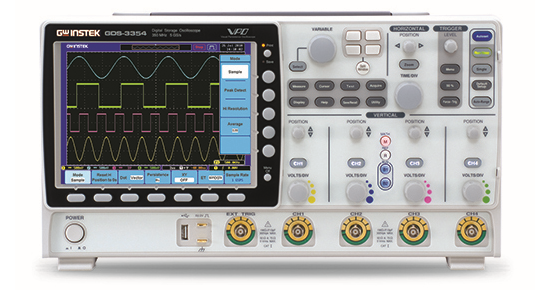 The GDS 3000 Series Digital Oscilloscope combines advanced signal processing technology providing a full-featured powerful analysis tool required to tackle complex measurement issues with ease. The GDS-3000 Series is a new platform of 4-input channels, 500MHz bandwidth, 5GSa/s sampling rate, and VPO waveform display. The split screen feature has been designed to meet the requirements of multi-window & multi-signal tests in the research and the manufacturing fields. The optional power analysis software and the optional serial bus analysis software are available to facilitate the engineer's tasks in testing and manufacturing of the associated products. Two differential probes, GDP-025 and four current probes, GCP-020 ,GCP-100 and GCP-530 & GCP-1030, are coming along with the GDS-3000 Series to provide total solutions for a wide variety of applications in the industry, service and education market sectors. The GDS-3000 Series, a high-tech platform carrying thoughtful features, brings very high customer value to both general purpose market and professional market.